Fifty-nine percent of voters in New Hampshire would choose Clinton if the Democratic Party's primary were held today. She's followed by Vice President Joe Biden at 15%. Eight percent would pick progressive darling Sen. Elizabeth Warren of Massachusetts, and 5% favor Sen. Bernie Sanders, an independent from Vermont. In January, Clinton brought in 73% support among Democrats and Democratic-leaning independents, according to a Washington Post/ABC News poll. But, in Thursday's survey, only 13% of Democratic respondents says they've definitely made up their minds about 2016, and 77% said they're still trying to decide. 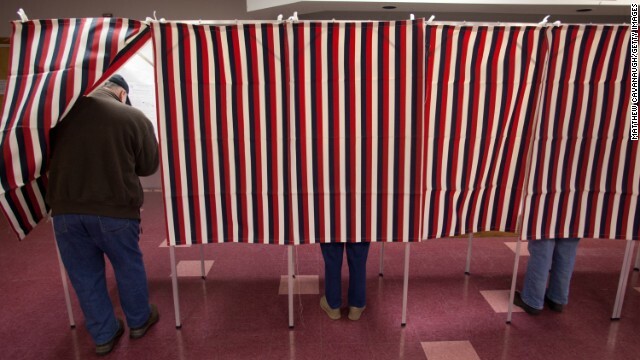 Republican voters in New Hampshire have anything but a clear-cut GOP nominee in mind. New Jersey Gov. Chris Christie leads other potential GOP White House contenders at 19%. He's followed by Sen. Rand Paul of Kentucky at 14% and former Florida Gov. Jeb Bush at 11%. Sen. Marco Rubio of Florida and 2008 GOP presidential candidate Mike Huckabee tie in the poll at 8%. All of the potential Republican candidates have made visits in recent months to the early voting state. The WMUR poll found that if 2012 GOP presidential nominee Mitt Romney were to jump in the race, he would be the overwhelming frontrunner for Republicans in the state. Thursday’s results echo findings from a Suffolk University/Boston Herald survey conducted last month showing the former Massachusetts governor as the leading conservative in the state. In both polls, no potential candidate but Romney breaks into the double digits. But, of course, that's all very hypothetical as Romney’s repeatedly said he’s not running for president again. The WMUR Granite State poll was conducted from June 19 through July 1 among 889 adults contacted by phone. Among the overall sample there were 257 likely Democrats and likely 251 Republican voters. The survey has a sampling error of plus or minus 6.9 percentage points. Did you see today’s news about how the Issa persecution heard from the military soldiers involved and they said there was no “stand down” order given? But keep the conspiracy alive! Maybe space aliens stopped them. From Area 51. What? There was no stand down order??? Really?? Grandma Clinton will NOT run for President when the Republicans control the House and the Senate. She would not be able to push her progressive agenda/disaster. I think she will instead opt to push the Grandma Reset button and enjoy the rest of her life outside the public arena. Is this supposed to make someone get upset? Is this display an example of what gets underneath the skin of conservatives? Thanks for the tip. Thanks for that info Dutch. Many news outlets today: ABC example: " Military officers testified that there was no "stand-down order" that held back military assets that could have saved the U.S. ambassador"
This Benghazi conspiracy theory is being made up as they go. There has to be some Illuminati or space aliens in this before too long. But I must say I love seeing the radical right keep hanging on and making this a sad spectacle. No conspiracy... just massive Hillary Clinton incompetence, gross negligence, lies and cover up. After I read your comment I Googled it. What I don't understand is why wasn't that story a headline everywhere?? After all Benghazi has been. I understand all news outlets EXCEPT Fox are running it. So telling. The radical right has set this up and put irrational fear in people's minds. Even when there is evidence to the contrary in Issa's own investigation from authoritative witnesses, they refuse to change the Myth. Like UFO's, when the Air Force's Blue Book project was finally declassified, and showed nothing interesting, the UFO folks immediately said it was a cover up and there was a MORE secret Blue Book. Conspiracy Theorists can always say that. It is one way to tell you are hearing from one. The talk show host version of this: "(yesterday my scare story was debunked) but when you here what secret is about to break in the news you will Be Shocked".